Dear Skylar Joy, You are 4 months old today! You're growing rapidly, little one. We're not sure how much you weigh yet (your 4 month check-up is next week), but I'm willing to bet it's 15 pounds or more. You're already in 6 month clothes and will probably be in 6-9 and 9 month clothes pretty soon! It seems like every day you are learning something new, trying to touch a new item, or getting better at a motion you learned yesterday. My precocious little girl, you are always curious, and always touching and exploring your world. Mommy & Daddy have loved introducing you to many new toys this month. The firsts for this month are very broad! Momma will try to list them all, but they are many! You are learning so quickly, baby girl! Okay... This month Mommy noticed (while stopped at a McDonalds on the way to Virginia) that you smiled when I kissed you! Previous to this you didn't seem to understand (or know what it meant) when I kissed you. But in that McDonalds you first seemed to realize that it's a good thing! And something to smile about! This warmed my heart and made me so very happy. Ever since kissing you usually elicits a smile or a giggle. This month you had your first looooong road trip (the first of many I'm sure). We drove from our old place in Virginia to Ohio for the week of Thanksgiving (and then all the way back to NC the Sunday after Thanksgiving). You rocked the trip, little one! We stopped 3 times on the way there and twice on the way back! Impressive! You were easily entertained in the car and slept most of the way there and back. Thank you for being such a good little traveler! This month you started wanting to pull yourself up with your stomach muscles. When you do this it looks sort of like "baby crunches" and you can't get all the way up to a sitting position without help. Daddy has loved helping you do this, though, and you guys often practice this move. You started doing this the most while at Pop Pop & Gram Gram's in Ohio for the week of Thanksgiving. As part of the "crunches" you're learning more about your feet & I'm pretty sure you know they're yours. You grab your feet often and pull your socks off a lot. You also hold your legs or feet back for me when I'm changing you! You do this fairly consistently. It's so cute. It makes me laugh. Thank you for being so helpful, little one! While in Ohio you also started teething for the first time. You still don't have any teeth, but we can see (and feel) some under the surface and you were chewing on anything and everything (including fingers) while we were visiting family in Ohio. You also were having trouble sleeping -- we think from the pain -- and we found creative ways to give you some Tylenol at bedtime. That seemed to help. Your teething has backed off some since we got home, but you still have some incredibly drooly days paired with lots of chewing. No teeth yet, but we're guessing you'll probably have some soon. A lot of new things happened while we were in Ohio! You also drank from a tiny little cup while Mommy and Daddy were visiting friends. It was just a bit of water, but we tried it out after you were interested in Mommy's cup. You definitely drank water and swallowed it from the cup. It was so very cute. You started getting more interested in toys and interacting with us and the toys. You're still not really into being by yourself with toys -- but this isn't surprising considering how much you like attention. One of your favorite "games" while in Ohio was pulling magnets off the refrigerator with Pop Pop. 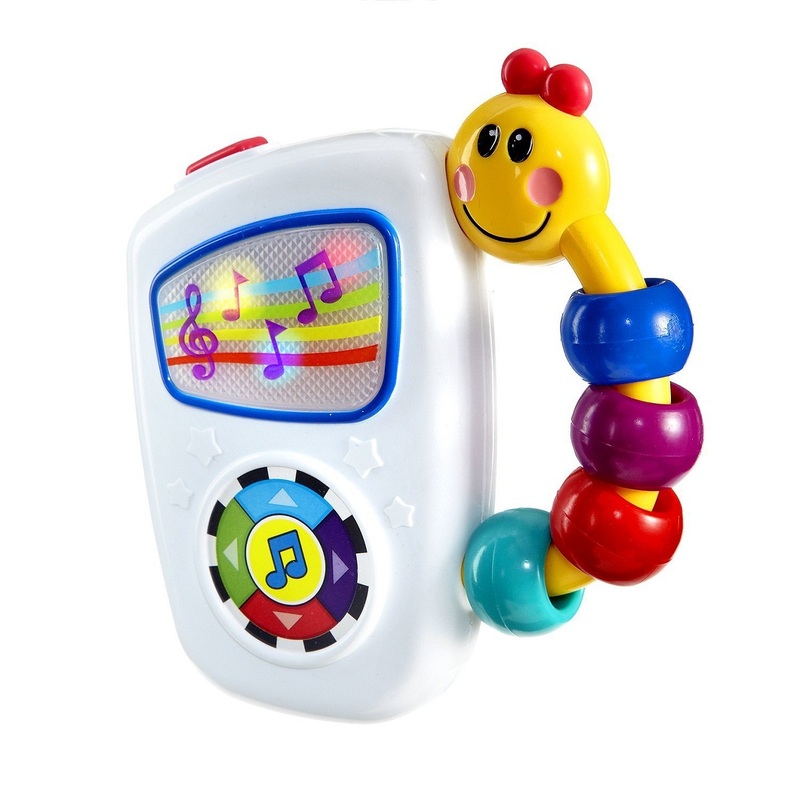 It was neat to see how quickly you figured out how to "play" and you learned to grab just the right way to knock off the smiley magnets -- often in one swipe. Another first was turning onto your side. But you didn't stop there! You turned all the way over several times in one day while in your "play-yard" on the living room floor. You also turned over a week or so later upstairs on your changing mat. I missed seeing you actually turning over each time because you did it right after I started to work on something. Silly girl! You're not turning over all the time, but you definitely can do it on purpose when you want to. You are pretty social, baby girl, and seem happier when out and about with people. You still love being held and interacting with people. Being in Ohio with tons of family was a huge treat for you. It's been interesting getting back to "normal" with just Mommy & Daddy, but not too terrible... you just like a lot of attention! One of Mommy & Daddy's joys this month was watching you work to "figure things out". You get this very serious look on your face and use your hands to try and grasp/touch things. Playing is very serious business and we love watching you! It's incredibly cute to see you care so much about what you're doing and we both love seeing you figure things out and explore. You seem to have gotten over being easily startled and scared by things. At least you don't scream much anymore if you do get scared. It still happens -- but really rarely. This is a relief for both of your parents! When you scream in fear or pain it's hard on both of us! Fortunately you've never been too terrible about it anyway -- but it being more rare is definitely a good thing! Another special moment I have tucked in my heart is the first time you put your elbows up on my chest while I was wearing you and stared at me until I looked down at you. It was *so* cute for you to do that and your expression was adorable! You do this from time to time in the Mei Tai (a loaner from the baby wearing group -- but we like it so much we'll likely get one of our own sometime soon!) and I love it every time. Speaking of the Mei Tai carrier, we did a successful "back carry" a couple days ago and 2 other times since then! You don't really seem to know what to think, but will sleep and chill in that carry for a while. Usually until you're ready for more interaction or until you want to be fed. It's really useful for me because I can get more done when I'm wearing you like that! & I'm so proud of my big girl being able to be on my back and relax there! The final "Mei Tai" memory for this letter happened just a couple nights ago. We were out with the neighbors and I started nursing you at the table (you were hungry and letting me KNOW it!). Well, I was talking particularly loudly at one point and you stopped eating, pulled back, and waited for me to look down at you. You GLARED at me with the angriest look I've seen yet because I was being loud while you were eating. You kept this expression for a good 20-30 seconds until your parents laughing (Daddy had joined me by then) finally made you smile and then giggle. You definitely wear your emotions on your face, Skylar Joy. Just like your Momma. As I typed the last half of this note you've been sitting in my lap. This is yet another new thing for you! You sit and watch TV with daddy & sit with me while I'm on the computer. The very first show you ever watched was a MythBuster's episode with your Dad. You loved the movements and all the colors. You also have started to love on the kitteh! You pet Harley for the first time this month. I love you two becoming friends! It's so cute & Harley is patient with your tugging -- to a point. We'll keep working on being gentle with the kitteh! Some of your favorite toys this month were: your pink taggie made by Lora of Tater Tots! The soft penguin your Gram Gram got you while in Ohio, Your "first doll" who has very yummy feet, and the rattle attached to your car seat (it is the ONLY thing that will keep you from crying when you've become impatient with being in your carseat). I can't wait to see what your favorites will be next month! Well, little girl, this letter is long enough! I'm sure I could go on for several more paragraphs about all the things changing, but I won't. These are the big things -- the things I will forever remember about this time in your life. I love you, baby girl. Always & Forever! This month has been filled with changes and growth. Your 2 month check-up at the doctor showed you are 12 pounds and 7 ounces. You're 23 inches long. You're in the 87th percentile for weight and the 75th for length! You're such a big girl! And so very strong. The doctor and nurses were surprised by how well you hold your head up and move your head around. Mommy wasn't surprised since I've watched you do that for a long time, but it was cool to hear others oooh and ahhh over you! This month you started showing Daddy and Mommy that you are hungry by moving your mouth and tongue -- instead of just crying to eat. You still cry if we wait too long to feed you, but you've definitely started communicating more with us. You slept longer than 5 hours for the first time this month! You actually slept for 7 hours two nights in a row while we were in a hotel room for our house closing. You surprised both Mommy and Daddy by sleeping for so long. You smile consistently now and always smile "hello" to your Daddy when he gets home at night. You have little cooing conversations with your Dad to tell him what's going on. I love watching you two interact. It warms my heart so much. You talk to Mommy now too! It's usually while you are breastfeeding. You laughed in your sleep a few times during this past month. You also have giggled a couple times when interacting with Mommy and Daddy. You're not consistently laughing yet, but so very close to it! The first time you giggled Daddy was around and you giggled at Mommy first and then Daddy when he came over to see you. Your timing was pretty perfect, little girl! Good job! This month has had some ups and downs, but you've relaxed a lot, sweet girl. I think The stress of moving and everything that was going on took a toll on you. You were pretty fussy for a while, but have settled into a much more calm pattern. Recently I noticed that you seem to be able to see much better. You watch the world from the safety of the Moby carrier. You also seem to be seeing much more from the carseat in the car. You look outside and watch the lights and everything passing by and are entertained by it. This is a huge relief to me because hearing and watching you cry in the car was really rough for me! Another "first" for this month is you learning to fall asleep without having to be nursed or rocked soundly to sleep. When Mommy puts you down for a nap or at night you usually open your eyes and wake up some, but consistently you have fallen back asleep on your own without having to be picked up. I'm so very proud of you! One new change that's very hard for your Mommy is that you are crying tears now. When you cry your eyes fill up and tears spill down your little chubby cheeks. It breaks my heart to see your tears, but I know this is just another way that you are growing and changing. Another thing that was tough for me was that you had your first cold this month, baby girl! You were very needy along with your cold symptoms. For several days the only way you would nap during the day was in the Moby. Mommy held you close and helped you feel better using the Kangaroo technique of skin-to-skin contact in the Moby. You're all the way better now and I'm so glad! Recently you have found your lips and tongue. You smack your lips and brush them against my arm, my shoulder, my chest and you blow bubbles with your drool. (Oh, yeah, lots drool is another new thing. But that could be partially from your cold.) You play with your tongue and try pushing it against things. You often lick Mommy's shirt or chest (depending on how you're in the Moby) and pretty much lick anything that comes close to your mouth. It's cute and gross at the same time. But we love that you're growing and learning about your environment, baby girl. Keep growing little bean -- but not too fast. Mommy wants you to be little and in her arms for a long time!